A spot about faith, life, place, art & music, answers, and questions. 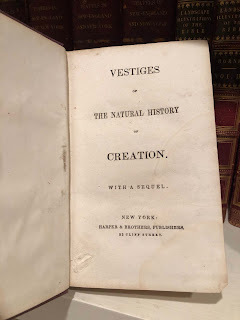 "Vestiges of the Natural History of Creation"
I love antique books, and during the last few years I've been collecting a few notable science books from the nineteenth century. I like to write about them on this blog, teaching myself many new things in the process. Here is a book set the stage for Darwin! 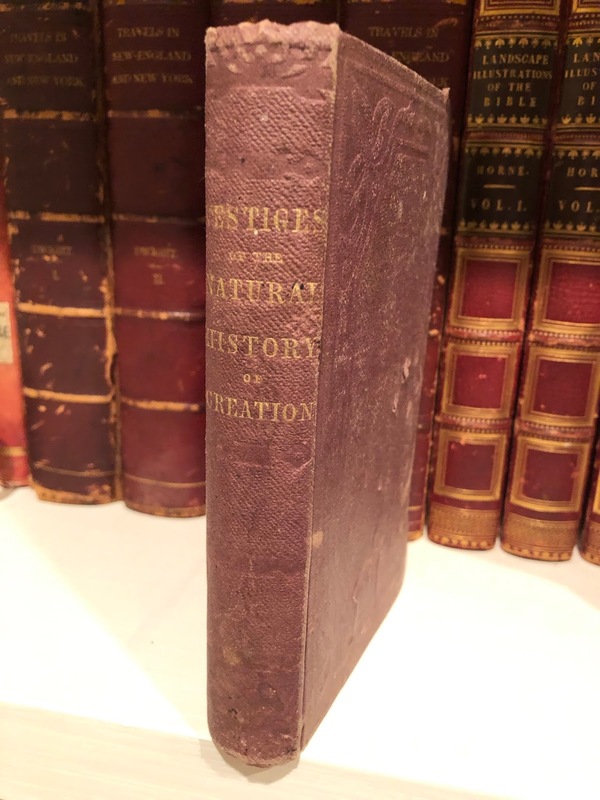 Vestiges of the Natural History of Creation was an anonymously published book of natural history from 1844. It was a best seller, said to have even been read by Lincoln! According to the author--eventually revealed to be Robert Chambers--all thing sin existence developed from earlier forms through what we would now call transmutation or evolution. Although his science (and racist view of humans) are deficient, his notions of development of species and natural law, that were created but not necessarily guided by Providence, were influential at a time when similar theories by Jean-Baptiste Lamarck were not held in high scientific regard. The book caught the attention of young Darwin, well ahead of his Origin of Species. He was already developing his hypotheses about special development, and because of the popular responses to Vestiges, he was able to foresee some of the controversies that would greet his own work. Sometimes small things warm your heart, and in this case, I thought of all the Farm Service signs that were common around the countryside where I grew up. Plus, the Illinois communities Olney, Newton, and Lawrenceville were places Dad visited during his delivery routes. 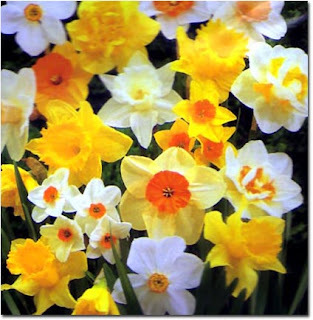 All kinds of interesting historical information about the ceremonies and customs of Easter, which of course is celebrated today in the Western churches, and next Sunday in the Eastern churches. It's the 20th anniversary of the shootings at Columbine High School. I remember that I was just pulling up to the parking lot at Indiana University Southeast, to teach my undergrad New Testament class, when the news came on the radio. 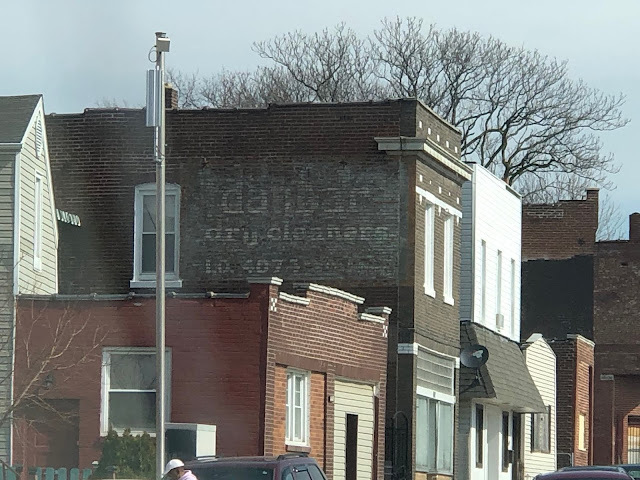 Old 66: Gravois Rd. and Tucker Blvd. ORDER MY NEW POETRY BOOK! ORDER MY THIRD POETRY BOOK! "Small Corner of the Stars"
ORDER MY BIBLE STUDY BOOK! "Walking with Jesus through the Old Testament"
ORDER MY SECOND POETRY BOOK! ORDER MY FIRST POETRY BOOK! "Dreaming at the Electric Hobo"
The contents of this blog are my personal views and opinions and are not in any way representative of my employers, publishers, or any associations or organizations with which I'm affiliated. Welcome to this blog, which I've been keeping since 2009. Please feel free to browse the contents, or follow it for updates. Check back as often you'd like! My recent focus for this blog has been year-long series on subjects in religion and spirituality, each undertaken as an enjoyable discipline to keep my own spiritual life on a positive path during a time of bereavement. In 2014, I listened to and wrote about Bach's sacred cantatas on or near the Sundays and special days for which they were written. In 2015, I wrote about special days celebrated by different world religions. In 2016, I studied the lives of saints and faithful persons honored on different Christian liturgical calendars. In 2017, I plan to study the Bible a few chapters at a time through the year. My hometown area, Fayette Co., IL, is always an anchor and "conceptual continuity" for me. The header photograph is from that area, near Brownstown, the vicinity where my maternal ancestors settled before the Civil War. All original material copyright 2009-2019 by Paul E. Stroble. All Bible quotations in this blog are from the New Revised Standard Version unless otherwise indicated. The New Revised Standard Version Bible is copyright 1989, Division of Christian Education of the National Council of the Churches of Christ in the United States of America. I'm a devoted family guy, a college and seminary prof, a United Methodist elder, and a freelance writer. I've written 20 books and have contributed to 10 others. As with this blog, I enjoy delving into a variety of subjects. My recent books are "Walking with Jesus through the Old Testament: Devotions for Lent", and the poetry chapbooks "Dreaming at the Electric Hobo," and "Little River." My other books include a study book on Galatians, a book on the sense of place, a study of Karl Barth's theology, and another on science and religion. My book "What Do Other Faiths Believe?" has sold over 20,000 copies. 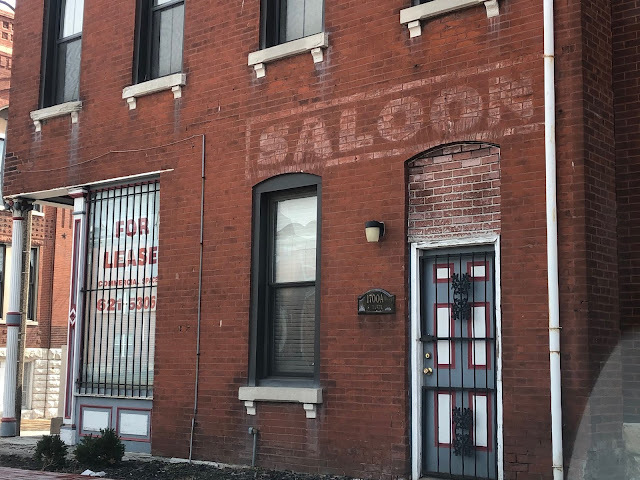 My first book, "High on the Okaw's Western Bank," is a history of my hometown (Vandalia, IL) when it was the Illinois state capital, where Lincoln and Douglas began their political careers. In addition to numerous articles, essays, lessons, meditations, reviews, and poetry, I also wrote or researched over 180 issues of the online curriculum "FaithLink," on many contemporary topics like health care, climate, poverty, prison reform, family, education, and others. Several of my books are available at www.cokesbury.com, as well as amazon.com. Among my popular study books are "Walking with Jesus through the Old Testament," "You Gave Me a Wide Place," "Paul and the Galatians" and "What About Religion and Science?" Click on the photo to purchase these and others. "The Kentucky Council of Churches, 1947-1997," manuscript in the Filson Club, Louisville, KY. Faithful Citizen (principal author), FaithfulCitizen.net (Logos Productions, 2011). Books and studies to which I've contributed. 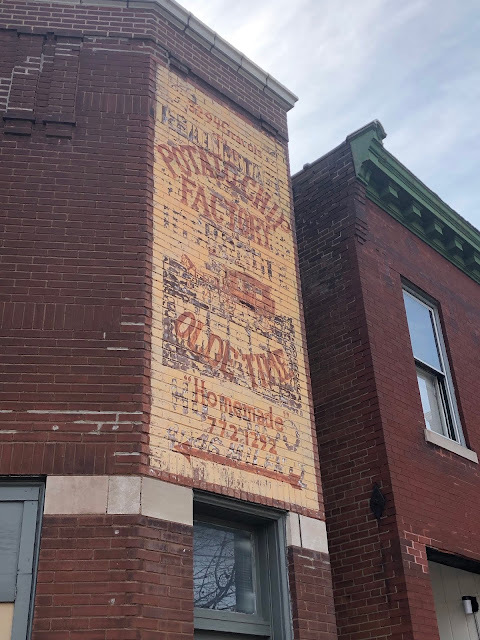 Vandalia Remembered: Celebrating a City with a Capital Heritage, 1819-1994. Leader-Union Publishing Co., 1994. Becoming the People of God: Living Faithfully as Friends and Family. Abingdon Press, 2001. Becoming the People of God: Caring for God's Earth. Abingdon Press, 2002. Becoming the People of God: Walking Humbly, Doing Justice. Abingdon Press, 2002. Becoming the People of God: Forming a Global Family. Abingdon Press, 2003. Becoming the People of God: Opting for Virtue in Public Life. Abingdon Press, 2003. Becoming the People of God: Working Together: Sharing the Bounty. Abingdon Press, 2003. Living by the Word. Chalice Press, 2005. 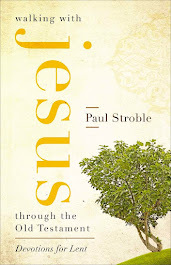 "Grace, Place, and the Like," paulstroble.wordpress.com, is an "annex" of this "Journeys Home" site. "Psalm 121," http://hundredtwentyfirstpsalm.com are my reveries and notes around my favorite psalm. "Changing Bibles," changingbibles.blogspot.com are brief notes and informal studies of the Bible. "Bible Connections," bibleconnections.wordpress.com, are essays that trace themes and connections across the Bible's books. "The Love of Bible Study," theloveofbiblestudy.com are essays about the seasons when I perused the pages of my beat-up, 35-year-old Bible.